In textile industry, count is a numerical expression, which expresses the fineness or coarseness (Diameter) of the yarn. It also indicates the relationship between weight and length (Length per unit mass or mass per unit length or) of that yarn. According to textile institute, yarn count is a number which indicates the length per unit mass of yarn or mass per unit length of yarn. Indirect yarn count- Metric, Worsted, English. Direct yarn count- Denier, Tex, Pounds per spindle. Indirect yarn count expresses the number of length units in one weight unit. That is why, higher the count, finer the yarn. Indirect yarn count system is generally used for worsted, linen, cotton yarn. Direct yarn count expresses the number of weight units in one length unit. That is why, higher the count, coarser the yarn. Direct yarn count system is normally used for jute fiber, synthetic fibre, silk fiber etc. The yarn count of cotton yarn is done with the English system and the Metric system. Today, the English system is commonly used. In it the yarn with 1lb weight and 840 yards length is said to be 1 count. (Usually abbreviated as 1 No.) as a standard. The number, which shows how many times it is of 1lb weight and 840 yards length, is the count number. Accordingly, in contrast to the case of Denier, if the count number greater, it shows that the yarn is thinner. The metric system is after all, the constant weight system but in it, the yarn of 1 kg weight and 1km length is said to be of 1 count. The yarn of 2km length is of 2 counts. Thus, the number, which shows the length of yarn having 1kg weight in km, is the count number. The count of cotton yarn is usually kept to even numbers like 20, 32, 40 or 60 etc. the cotton yarns of uneven number, such as 21 or 65, are prepared only for special purposes. As the general tendency, the thickness of cotton yarn is shifting towards fine count every year along with the improvement in the cotton cloth. At present, in Japan, the best one is prepared with 200 counts. But, the average production all over is of 30-32 count. 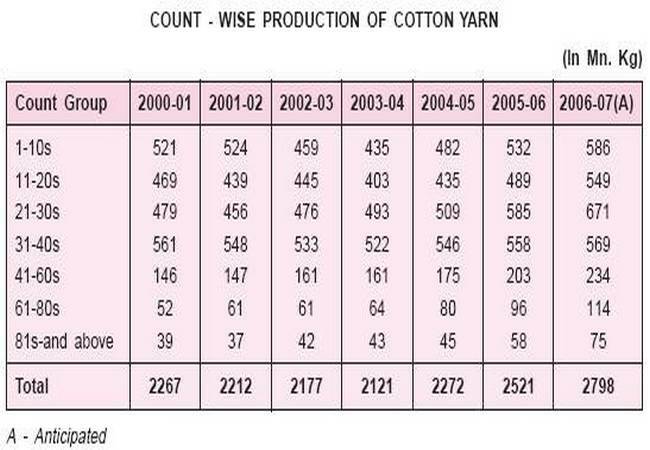 Since the coarser count is prepared at the export destination also, fine raw cotton is usually exported. The yarn with 60-80 count generally occupies more than half of the export volume.